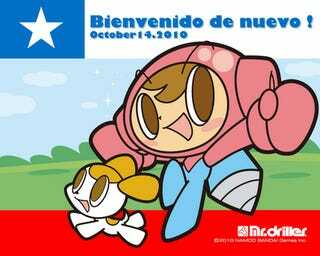 To mark the release of the 33 Chilean miners, Namco Bandai created the above image, which features the character Mr. Driller. Today, the company has removed the image and apologized. Regarding the image, Namco Bandai tweeted earlier today that the image lacked consideration. Because of this, the company has taken it down. "We would like to offer a profound apology to everyone," the company added. "It was inexcusable." The image might have been laced with dark humor and somewhat obvious, but really? Inexcusable? Really? This comes as the Chilean media has already made the comparison between Super Mario and one of the rescued miners.